UB held a tabling session providing information about the broad-based fees students pay every semester. Students were able to ask questions about the fees but very few students attended. 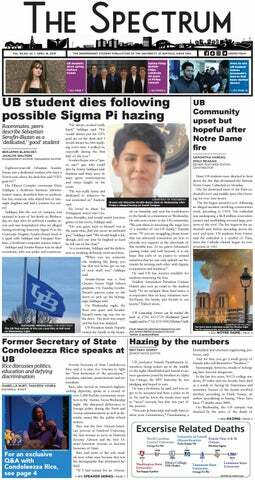 UB held a meeting on broad-based fees Wednesday evening for students to discuss service enhancements or programmatic ideas that are funded by university fees. Broad-based fees are typically charged to all enrolled students and finance activities that benefit the student body. The comprehensive fee is a consolidation of campus-required fees that support several university services. Despite the two-hour meeting being advertised in the Student Union and a reminder being sent to all students on Monday, only nine students attended the meeting. Among the nine students in attendance were the SBI President, SA treasurer, SA Chief of Staff and GSA treasurer. SA Treasurer Tanahiry Escamilla said the structure of this meeting was different compared to previous years because students had the opportunity to ask questions and provide feedback for fee holders. There was no increase in broad-based fees this year, but in February, the Office of the Provost announced its plan for a five-year, 2.53 percent comprehensive fee increase. Wednesday’s turnout was significantly lower than the town hall-style Q&A held in February, where 45 students attended and voiced their concerns over raising fees and how they’re spent. Representatives from all nine components of the comprehensive fee –– athletics, Campus Life, college, health, recreation, technology, transcript, transportation and academic excellence and success –– were present to answer student questions. Fee holders said they plan on using students’ questions and concerns for their upcoming planning efforts for the broad-based fee process.